The continuity and spread of Buddhadharma throughout the world depends upon highly qualified teachers. The three great monasteries are the only place in the world where the entire, complete teachings of the Buddha are studied and practiced with deep logic. The Lama Tsongkhapa Teachers Fund was established by FPMT in 1997 at the request of His Holiness the Dalai Lama. The purpose of the fund is to preserve the Gelugpa School of Tibetan Buddhism, and cultivate the teachers of tomorrow. Since its inception, the Lama Tsongkhapa Teachers Fund has supported up to 150 senior teachers each year such as the current abbots, past abbots, the Ganden Tripa (spiritual head of the Gelugpa school), together with hundreds of monks attending the traditional winter debate and annual exam. The great lamas of the Tsongkhapa tradition preserve the teachings and practices that have been passed from teacher to disciple in an unbroken line beginning with Lama Tsongkhapa himself. This fund is able to offer a small monthly stipend (ranging from $10 – $30 a month) to 150 of the main teachers of the 8 great monasteries of the Lama Tsongkhapa tradition. This small offering supports the basic needs of the current Abbots, past Abbots and main teachers of the Lama Tsongkhapa tradition, including the Ganden Tripa. These incredibly precious teachers do not receive any money from the monasteries and this small offering allows them to be able focus more of their time on transmitting the lineage of teachings and practice to their students in the monastery. These great Gelugpa centers of learning are places of practice and growth founded by Lama Tsongkhapa and his disciples. The traditional teaching lineage has carried right through to today, as shared by Geshe Thubten Sherab’s in his reflections of Life at Sera Je. Each year the foremost scholars from Sera, Ganden, Drepung, Gyume, Gyuto, Tashi Lhunpo and Rato monasteries come together for the annual Gelugpa exam and the Lama Tsongkhapa Teachers Fund is able to cover basic expenses, such as food and travel, for the 600+ monks who take this exam. The annual winter debate dates back to the time of Lama Tsongkhapa and was continued each year until 1959. In 1981 the present and former Abbots of the three great monasteries met to revive the annual winter debate, however due to costs the monasteries were only able to sponsor about 200 monks to attend the annual winter debate. Seeing the incredible importance of the winter debate, where the best scholars gather to hone their understanding of the Buddha’s highest teachings, FPMT undertook the responsibility to cover all the costs for the monks of Sera Je monastery to attend the debate each year. FPMT has now also started to sponsor the annual winter debate that is also held in Nepal by the Nepal Buddhist Gelug Association. 2013 was the first time in history that nuns also participated in the debate. The Lama Tsongkhapa Teachers Fund continues to support the great teachers and scholars at Sera Je and Mey Monastery. This monastery is recognized as one of the largest monastic institutes and learning centers of traditional Tibetan Mahayana Buddhism in the world. 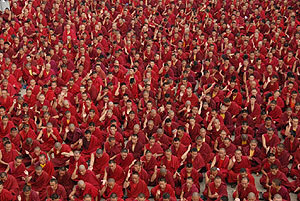 There are 6080 ordained monks studying at Sera, and another 550 novice monks also studying. Teachers at Sera Monastery offer the entire course of studies associated to the Gelugpa school. 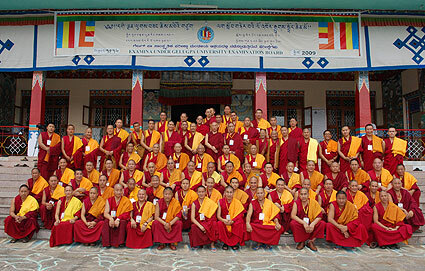 The distinctive Geshe degree, and Lharam level (which is the highest monastic academic degree) is conferred at Sera. The support given by FPMT’s Lama Tsongkhapa Teachers Fund to scholars and great masters at Sera ensures that the Mahayana teachings are preserved for the benefit of all sentient beings. Or simply send your check in US dollars payable to FPMT Inc. and write “Lama Tsongkhapa Teachers Fund” on the memo line. The Lama Tsongkhapa Teachers Fund is a project of FPMT Inc. and is administered by FPMT International Office located in Portland, Oregon, United States. All donations made to this fund are tax-deductible within the United States in accordance with IRS Code article 501(c)(3) to the extent allowed by law.